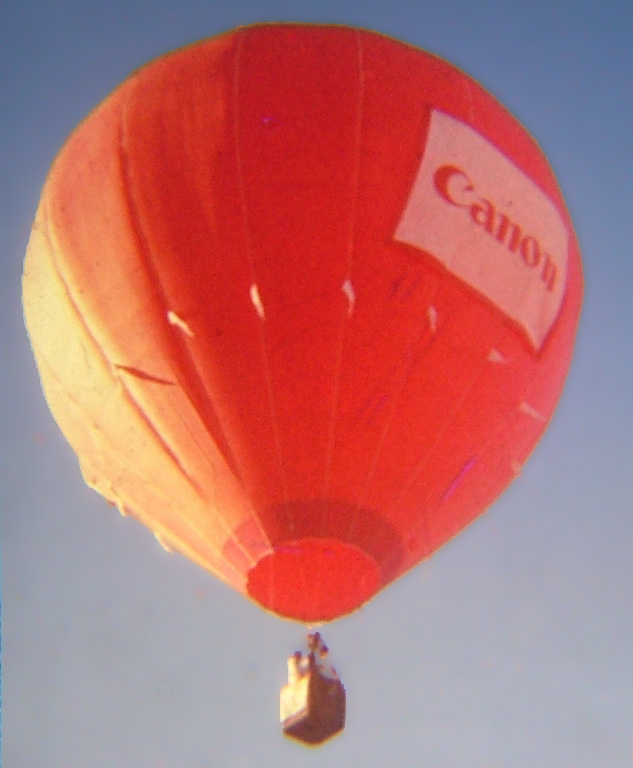 International Balloon Fiesta (Photo by the author). 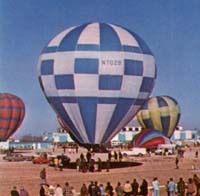 Mike Adams built four balloons (two in kit form) with Harold Carter in Georgia in the early '70s, and one of their creations flew at the first Worlds. 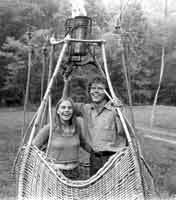 Adams and Carter parted ways, and soon thereafter, in 1974, Adams built the 62,000 cu. 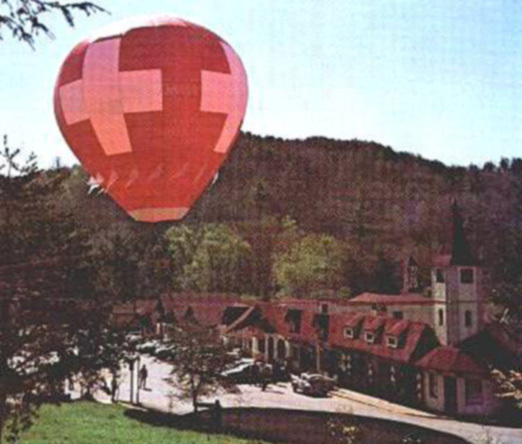 ft. "Swiss Cross" balloon at left for the "Alpine village" of Helen, GA (here's the balloon in the village, 1974). 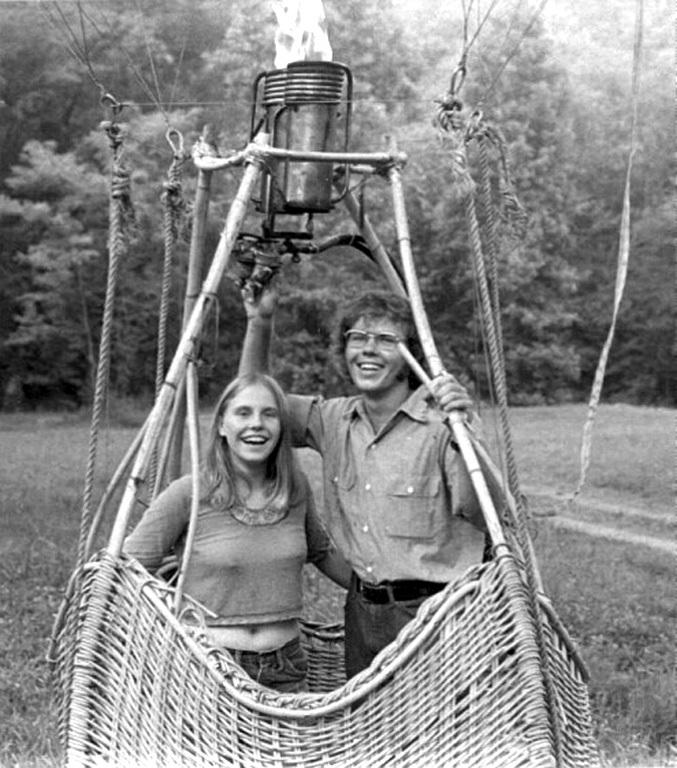 Around the same time, Adams met Tarp Head, then a student at Georgia Tech (Adams worked for an Atlanta advertising firm), and the two went into business. 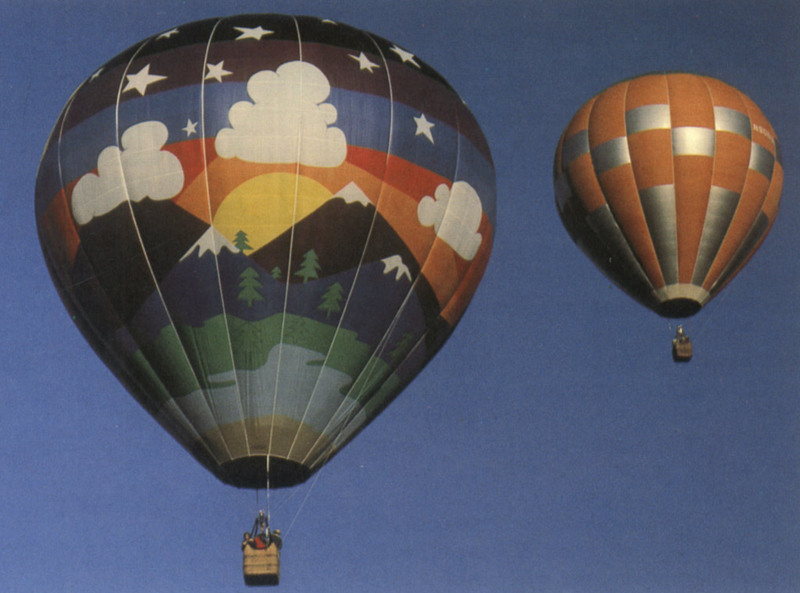 They formed Mike Adams Balloon Loft, set about to seek FAA type certification, and finished out the '70s making innovative balloons in Georgia (Head left in 1980 to pursue his own ideas of balloon design). 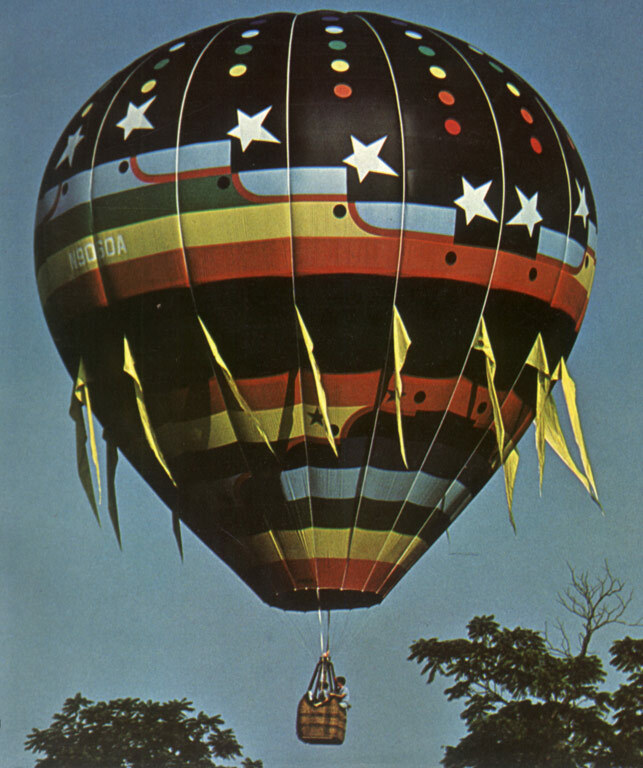 Adams balloons are known for their tough, flat-gored envelope, seductive gondola and arguably the best rapid-deflation system in the '70s, the clever and lightning-fast pop-top (also quite entertaining to watch in action). 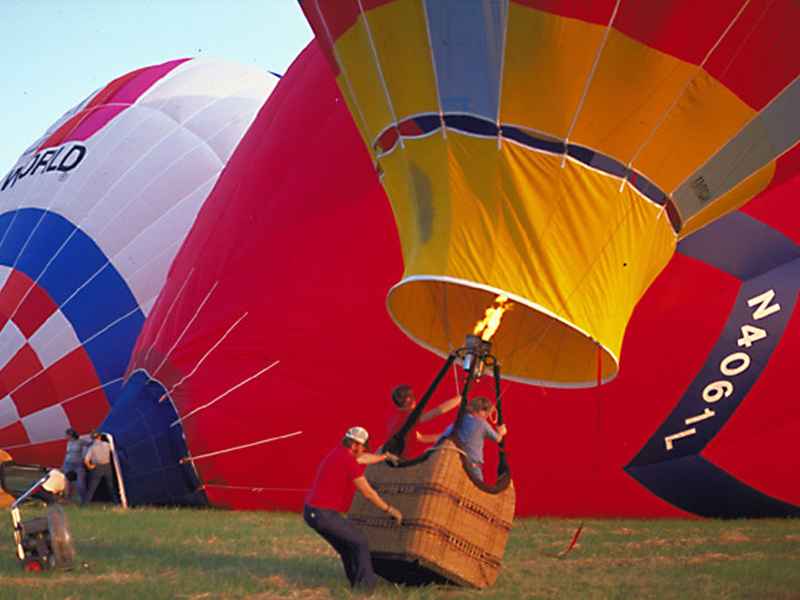 Some time after Head's departure from the company, Adams built a number of parachute tops as well, but the pop-top remained a permanent part of the Adams mystique, and most repeat buyers chose it over the 'chute. 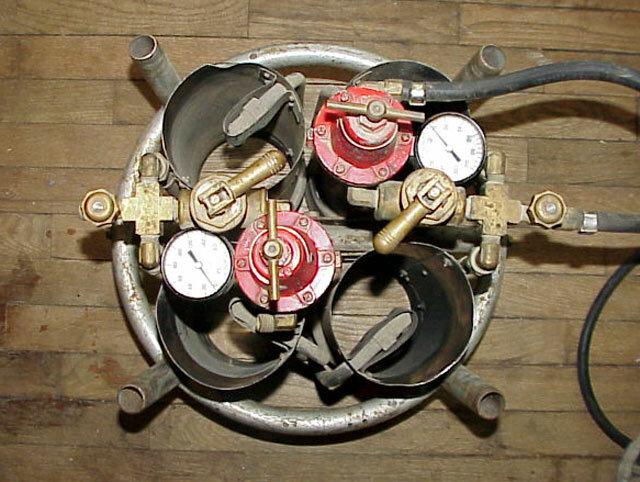 The Multi-Vent was a third alternative, but I know next to nothing about it. 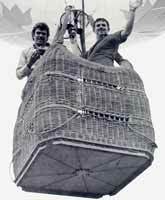 I've added a lot to this page over the years (thanks most recently to Mike Clark for the "Flying Chicken" pix and info, and to Tarp Head himself, who's been a great deal of help), but I'm still missing stuff. I need good shots of the MultiVent, a closeup of the KFC bucket-basket-banner, and - well - anything else cool I don't know about that I should have here. I'd like to know (and share) a lot more about Mike Adams himself, too. If you can help with any of that, please write me and help make my tribute to Mike Adams complete! Some files are over 200KB, so downloads may take a while. Those who know him say this is the Mike Adams they knew - eyes always to the sky, mind always in action. 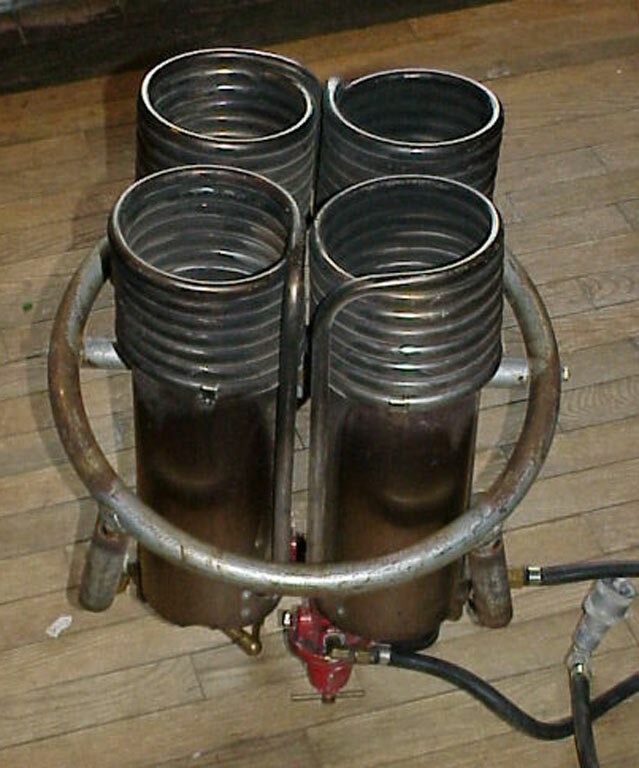 The distinctive Adams basket - the bulges push the tanks outward, maximizing floor space (here's a mid-'70s ad with a similar photo, and here's a nice color shot (¤) [albeit with the burner developed in the early '80s]). 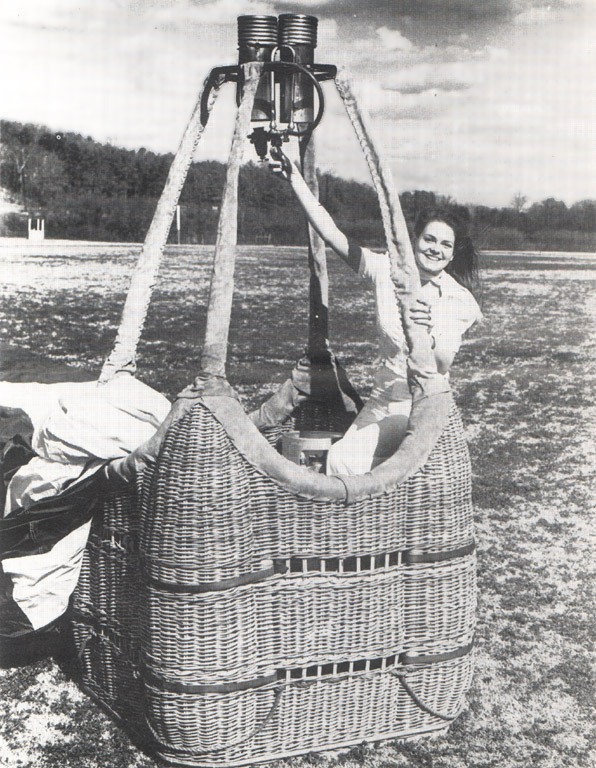 Mike built this basket for the "Swiss Cross" balloon, circa 1974 (the year Tarp Head and his passenger posed for this photo). 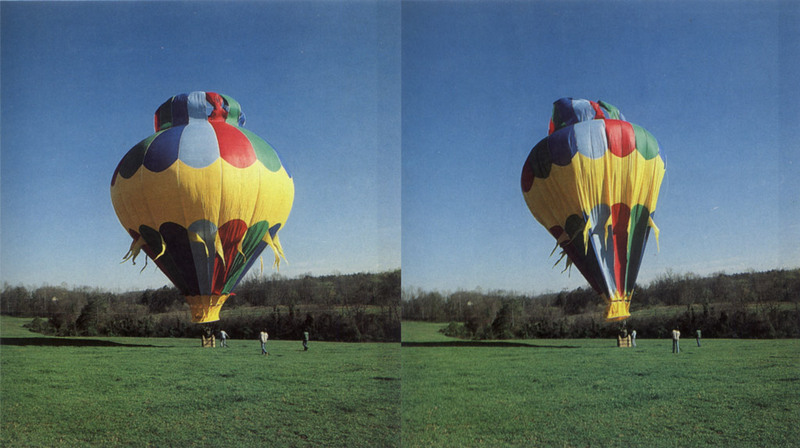 Subtle differences from the final type-certified design (see left) may be evident upon close examination. Mike Adams entered this 56,000 cu. ft. "A.C.E. 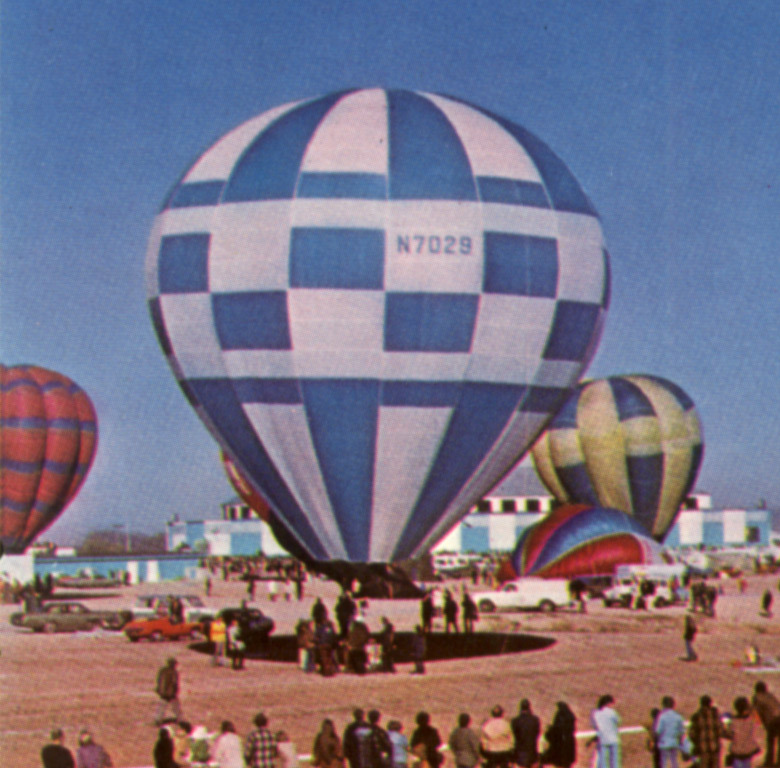 Sport" in the '73 Worlds ("A.C.E." stands for "Adams, Carter Enterprises"). 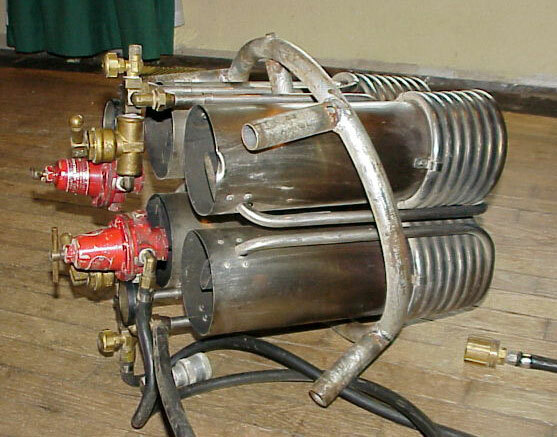 This one was built for Adams, the second was built for Carter, and the third and fourth were sold as kits. 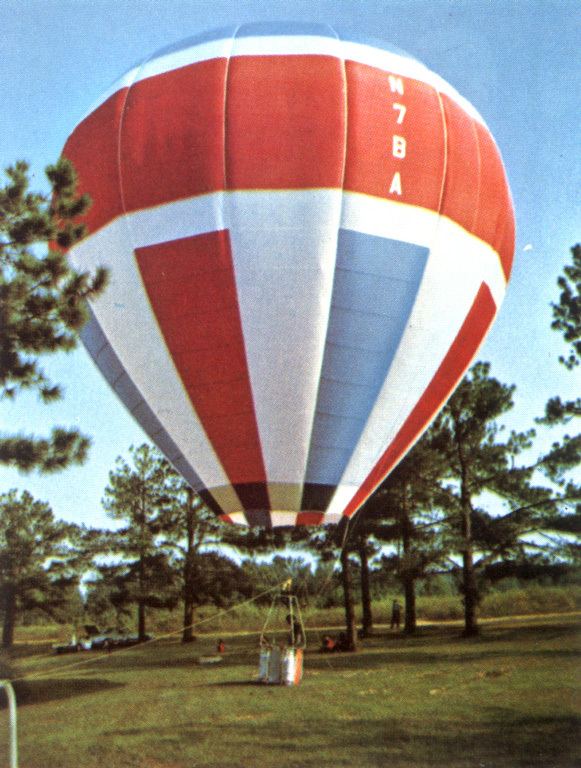 Though commonly regarded as a sport builder, Adams did its share of commercial work, such as the Purina balloon from the mid-late '70s. 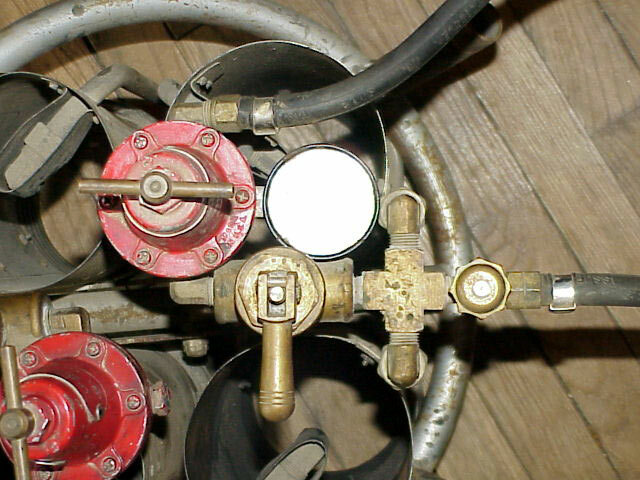 The pre-'81 burner came in four-can (from below, side view, plumbing closeup), and 2-can versions (Photo: Bill Hardin, collection of Lance Terry). 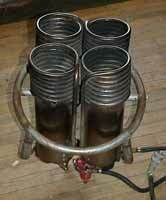 As of March 1980, only two 4-cans had been built, both for the KFC chicken special shapes. 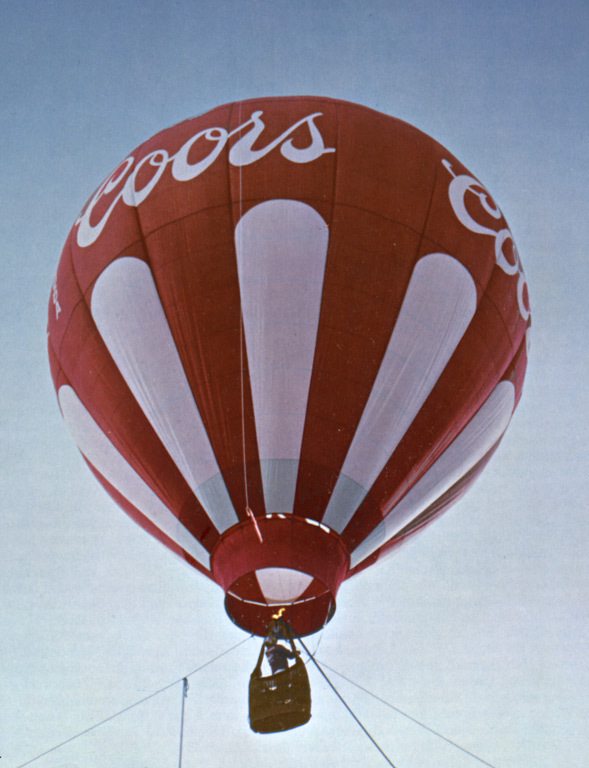 From an '81 ad, the famous pop-top in action. What doesn't come across is the inimitable flapping sound. 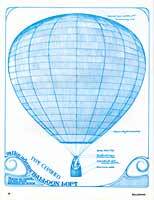 This iconic blueprint of the Adams system dates back to 1973 or so, but continued to appear in advertising and promotional materials, primarily due to the fact that it was really cool-looking. 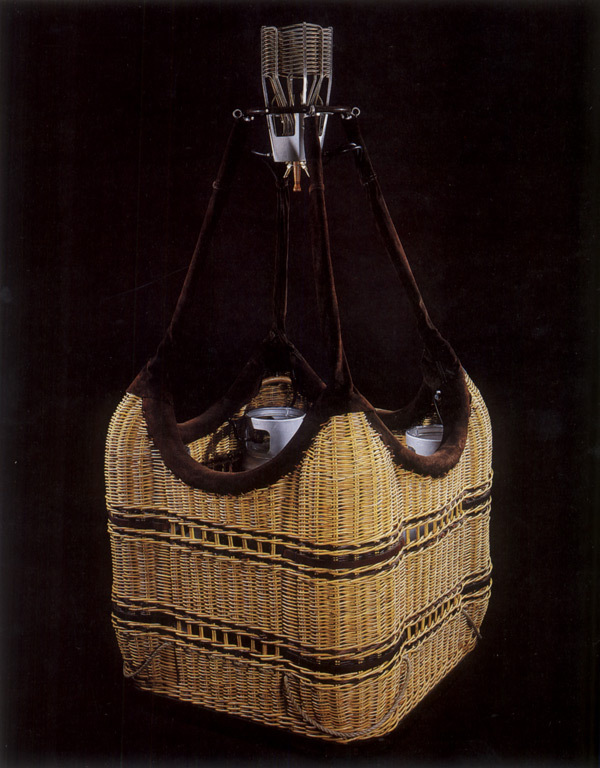 Debuting in 1977, the one-place, 16-gore Little Devil came in two sizes, and sported a 2' by 4' basket with room for one or two tanks. Neat plexiglas instrument panel in an '81 Little Devil. Adams' creativity in top design didn't end with the pop-top. 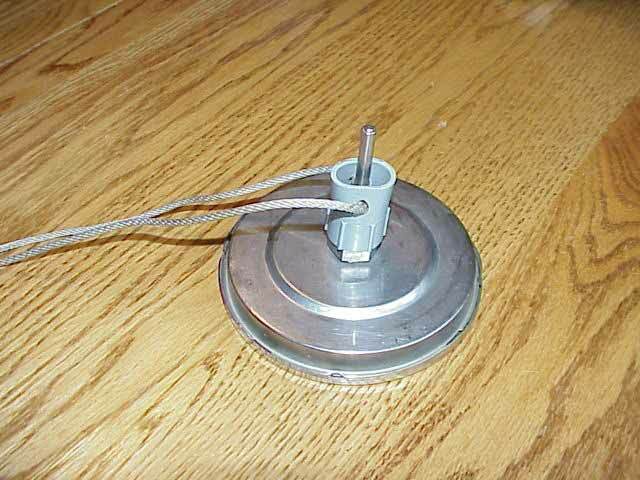 This is the "Multi-Vent," which, in addition to the usual venting duties, also afforded some upward visibility when open. 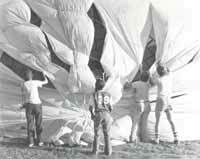 Parachute tops (¤) followed not long after Tarp Head's departure from the firm in 1980. 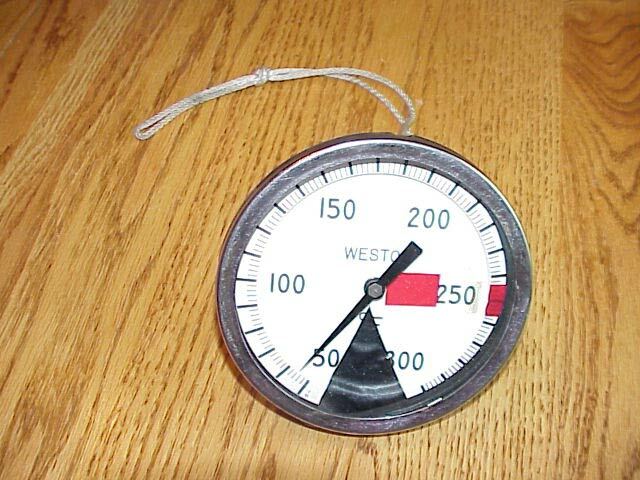 Traditionally, Adamses flew with these "turkey thermometers" in the crown, in place of the wired pyrometer (eliminating a major source of conductivity in the envelope) (back of thermometer). 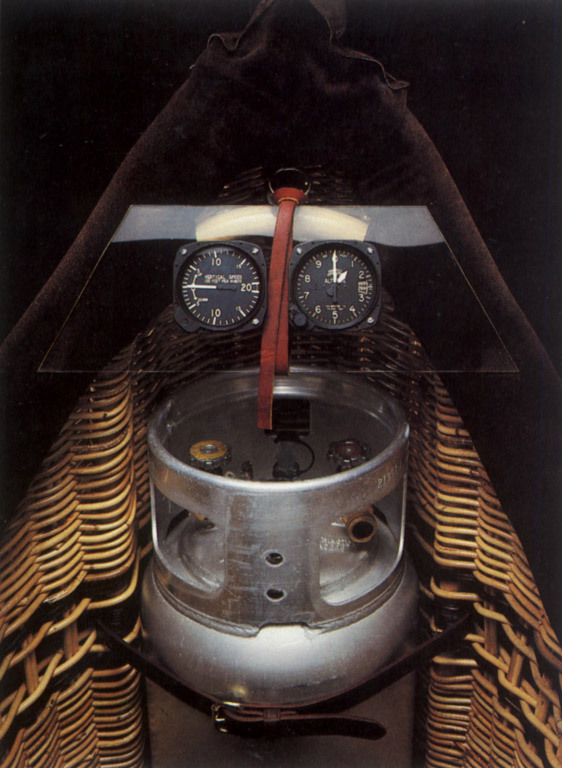 The flat envelope of this '77 model shows off artwork beautifully, with little to no distortion. 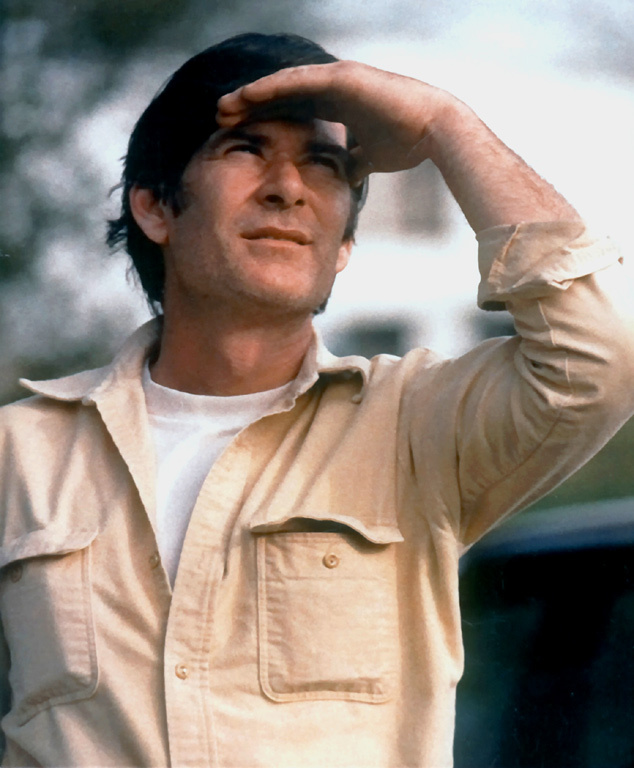 Here's (¤) another nice shot, this one from 1978, and here is the first Adams I ever saw in person (1980, photo by the author), attractive for its lack of complex artwork. 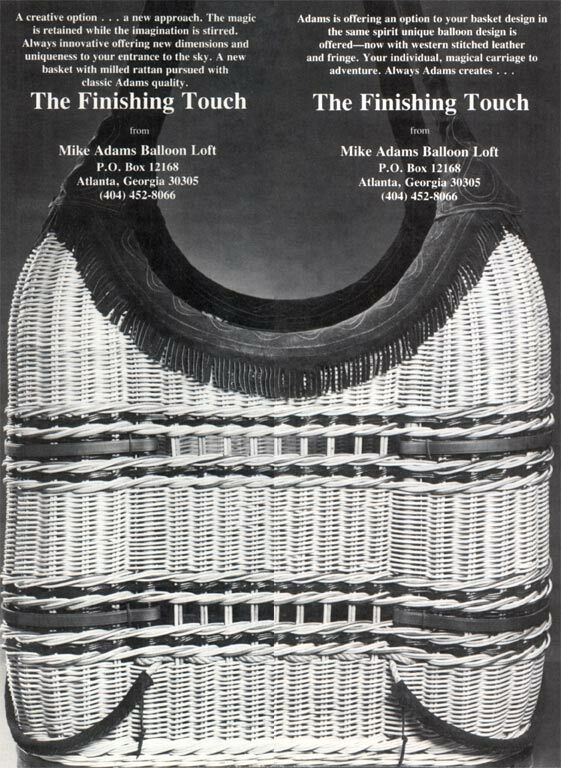 Nice shot from a 1977 ad clearly showing the basket and burner (many early Adams ads obscured the product somewhat). 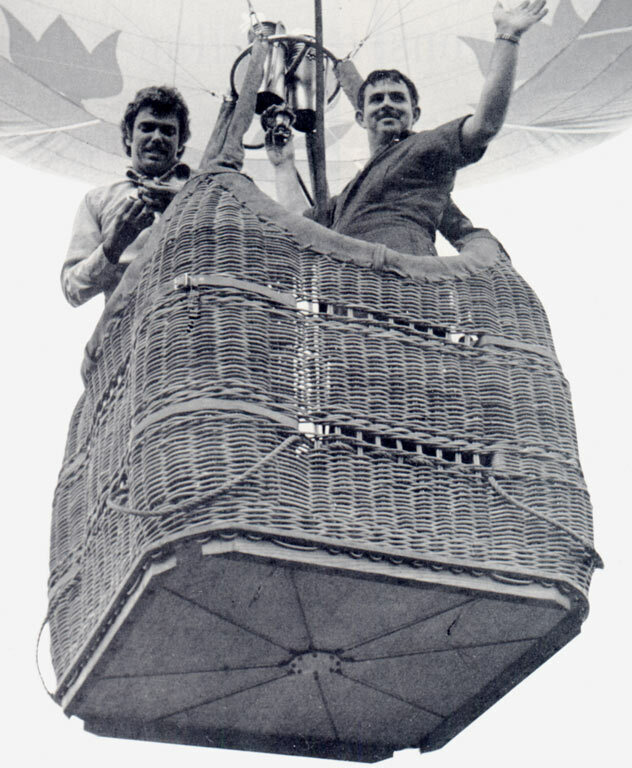 Ron Lively (right) owned the "Flower Garden" balloon, s/n 006 or 007, built in 1975 and used for some of the A50S type-certification flights. 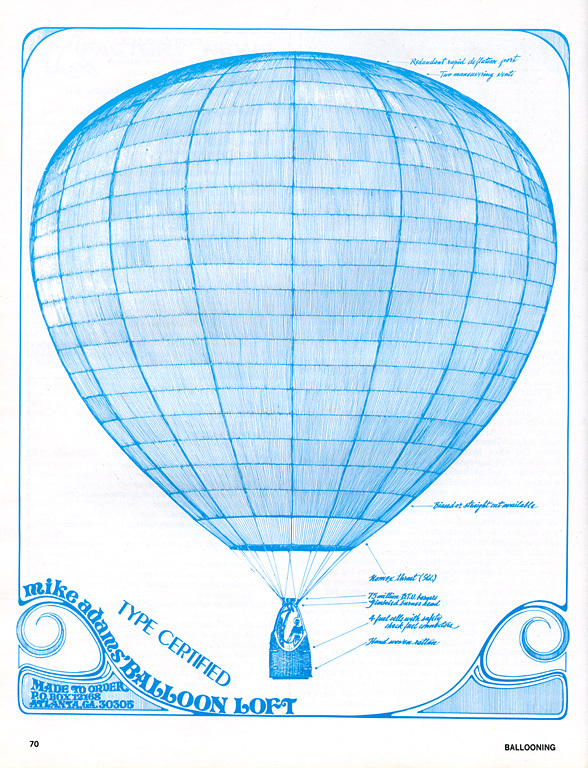 The first American maker to build a special shape (albeit an "appendage balloon," as opposed to a fully customized shape) was not one of the biggest, but it was one of the pluckiest. 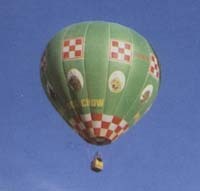 The Kentucky Fried Chicken Corporation approached Adams with the idea in the fall of 1975. 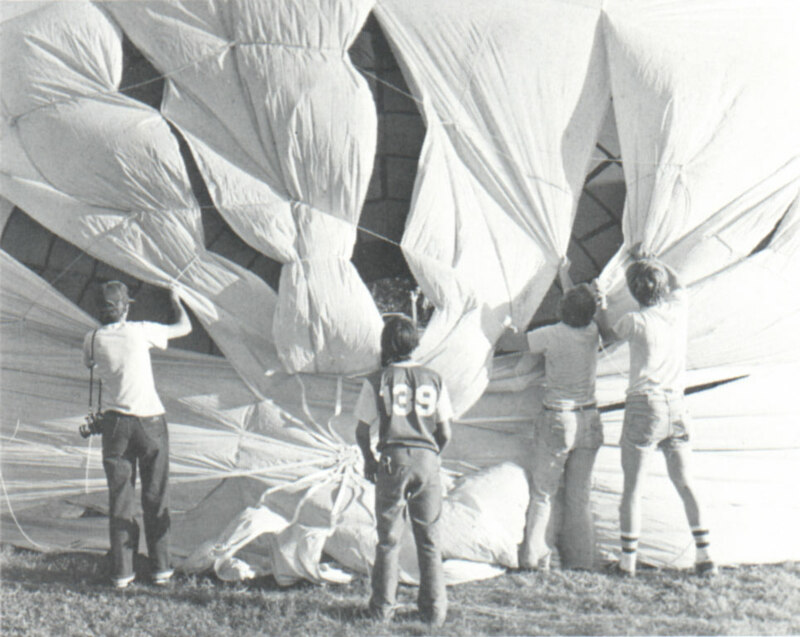 By January 1976, construction had begun, and on March 28, 1976 the great bird was test-inflated. 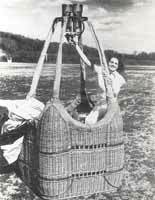 By that summer, the Adams A-50S-C was FAA certified and the Chicken That Could Fly was ready to go. The 66,500 cubic-foot balloon was flown by Matt Wiederkehr, who soon commissioned Greg Winker to replace the Adams pop-top with a Raven-style top and vent of Wiederkehr's design. Greg says today, "We put a lot of thought into where the side vent should go because if we made a mistake, I think a lot of people would have had a good laugh. We ended up putting it as close to the head as possible, but putting in as close to the tail as possible would have been a nice prank." 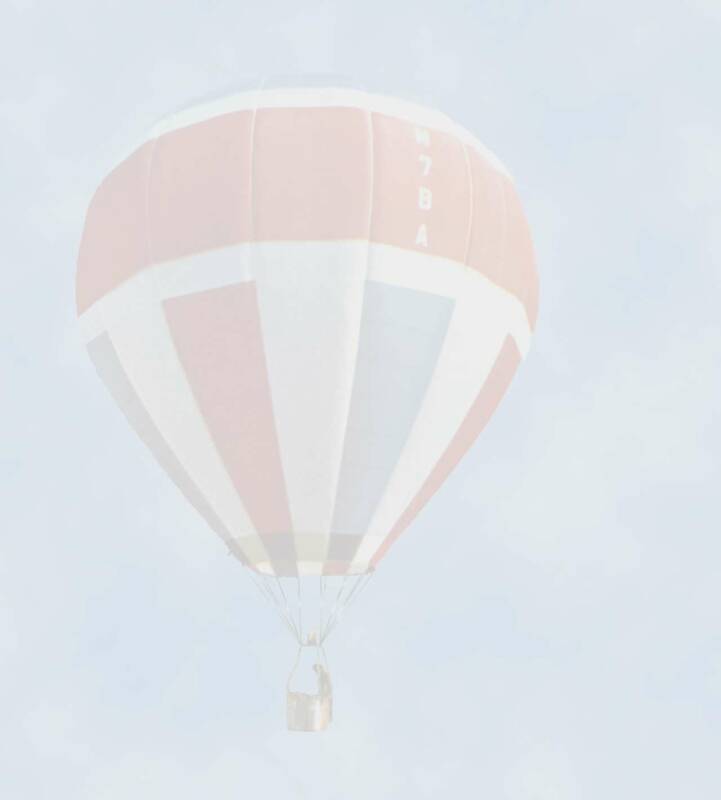 to display photos below. For a full-screen version of this gallery, click here. Special thanks to Tarp Head for much-needed input and fact-checking, George Garcia Jr., Deb Fowler and Robert "Professor Bob" Willbanks for providing information for this page, to Robert Kerr, for the scan of the "bucket basket" and those GREAT shots of the 4-can, to Mike Clark for the best shots of the chicken special shape and Greg Winker for additional information on the project. 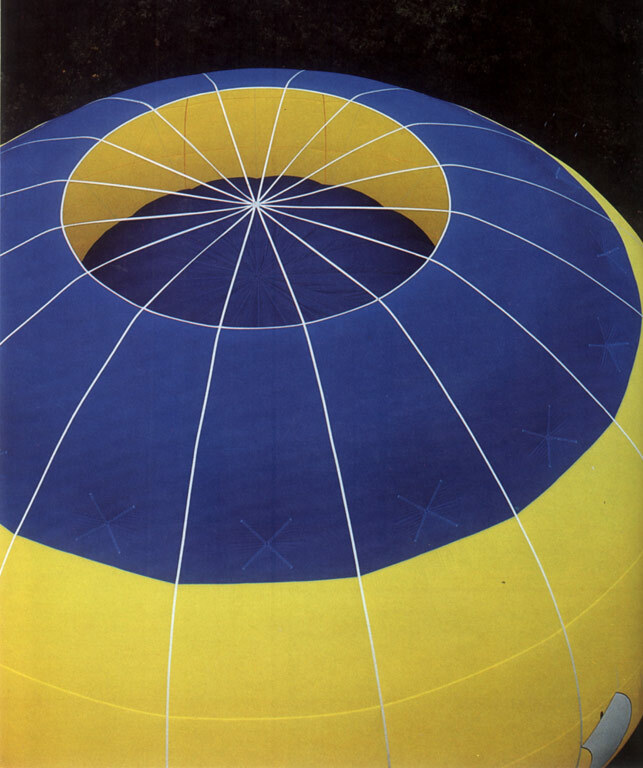 Extra-special thanks to Lance Terry, for the loan of his '78-'81 Ballooning magazines (and many contributions of images and words since! 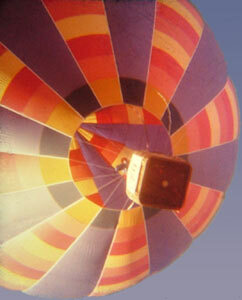 ), and to Glen Moyer and the BFA, for the generous permission to reproduce images from Ballooning.